CarGurus has 766 nationwide Azera listings starting at $2,999. The 2009 Hyundai Azera full-size luxury sedan earns high marks in a number of areas, including its overall performance, handling, and braking, as well as for its well-equipped interior, innovative features, and decent gas mileage. Some find the '09 Azera's exterior design unexciting, and a number of owners have reported having problems with the luxury sedan's detail work and overall fit and finish, requiring trips to the repair shop. The 2009 Hyundai Azera might be one of the best-kept secrets in the luxury-sedan segment. While it doesn't quite compete with more established luxury cars from other automakers, the Azera improves each year, delivering competent performance and handling, as well as state-of-the-art safety features and a spacious, comfortable interior, all at a relatively affordable price. The Hyundai Azera full-size sedan continues to improve its luxury car credentials by adding a number of new features for 2009. Hyundai adds a more distinctive front grille and alloy wheels, updates the Azera's suspension and steering, and gives the Azera's interior a more luxurious look with chrome and wood-grain accents, blue interior lighting, and an electroluminiscent instrument cluster. In addition, Hyundai adds a new audio head unit with a larger display screen as well as a number of new exterior color options, including Ivory Pearl, Black Onyx Pearl, Silver Frost Metallic, and Silk Beige Metallic, among others. Introduced in North America in 2006, although produced in one form or another by Hyundai since the mid-1980s, the Azera represents the automaker's answer to competitive entry-level luxury vehicles from Lexus, Infiniti, BMW, and Acura. The Azera scores well in side-by-side comparisons with most of its competitors, delivering solid performance, a smooth ride, good handling, and a wide range of luxury-oriented features, all at a relatively affordable price. The Azera comes in GLS and Limited trims for 2009. V6 engines drive both trims, although the Limited retains its more powerful 3.8-liter V6, compared to the GLS's 3.3-liter V6. Except for its new grille, the Azera's exterior design carries over from 2008 with no changes. The aerodynamic shape and balanced proportions help reduce wind noise and ensure maximum stability, Hyundai notes. Most drivers and reviewers agree the Azera sports a shapely exterior appearance, though some call its look conservative and unremarkable. Still, most find the Azera's styling appealing. A 234-hp, 3.3-liter V6 powers the GLS trim. The engine incorporates Continuously Variable Valve Timing (CVVT), which improves the engine's fuel efficiency, helps reduce emissions when idling, and ensures responsive performance. For the Limited trim, the engine upgrades to a more powerful 263-hp, 3.8-liter V6, also with CVVT. Both engines link to a five-speed automatic transmission with Shiftronic, which enables drivers to manually shift gears by tapping the gear-shift lever up or down. drivers. In addition to their responsiveness, the engines are fuel efficient. The GLS with the smaller V6 achieves mileage ratings of 18/26 mpg, while the Limited with the larger V6 checks in at a very similar 17/26. The front-wheel-drive Azera rides on a fully independent suspension with double wishbones in the front and a multi-link rear suspension, and features a rigid unibody structure designed to resist flexing. For 2009, Hyundai made adjustments to the Azera's suspension, including the dampers and bushings, to reduce body roll in hard turns and help the sedan better absorb road bumps and harshness. In addition, Hyundai equipped the Azera with a quicker steering rack, which provides more agile and precise handling. Some reviewers and drivers still find the Azera's ride a bit soft and floaty, especially over bumpy road surfaces, but most agree the sedan provides a balanced, capable ride with good maneuverability and a quick response to steering inputs. Four-wheel disc brakes provide a confident braking experience, delivering short stopping distances in emergency situations. The five-passenger Azera comes equipped with plush and roomy seats, which should keep passengers comfortable even over long distances. Even second-row seats deliver plenty of room for taller passengers, with more than enough legroom and headroom (44 inches of legroom in the front, 38 inches in the rear). Numerous storage spaces, including cup holders in armrests and back-seat pockets, make the Azera a family-friendly vehicle. The Azera offers an expansive cabin, with more interior space (123.5 cubic feet) than the Toyota Avalon, Mercedes Benz E-Class, and the BMW 7-Series, according to Hyundai. Drivers and reviewers give the Azera good marks for interior fit and finish, as well as for its handsome dash and easy-to-access controls. While some feel the Azera falls short when competing with more established cars from upscale automakers, most agree the Azera offers an elegant, well-equipped interior, with plenty of standard and optional features sure to please all but the most discriminating drivers. New interior features for 2009 include metalgrain accents, interior trim panels with better contrast, and blue backlighting for gauges, switches, buttons, and steering-wheel-mounted controls. In addition, Hyundai offers a new brown interior accent color. Standard features for both trims include automatic dual-zone climate control, cruise control, a leather-wrapped steering wheel and shift knob, and power-adjustable front seats. The Limited trim adds luxury touches like leather upholstery, heated front seats, a power glass sunroof, and a power rear sunshade, which helps keep the cabin cool. 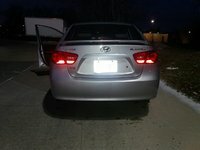 It extends over the rear window when the car is moving forward but automatically retracts when the car reverses, so the driver can have an unobstructed view out the rear. The GLS comes equipped with a 172-watt, six-speaker AM/FM audio system with a CD player and an MP3 input jack, while in the Limited trim the audio system upgrades to a 315-watt, 10-speaker Infinity system with a six-disc CD changer and a USB port, which drivers can use to charge an audio device. In addition, using the USB port, drivers can access tracks on an MP3 device through the steering wheel's audio controls. Options for the Limited trim include an in-dash LG touch-screen navigation system, a 12-speaker, 605-watt Infinity Logic7 surround-sound audio system, rain-sensing wipers, and an Integrated Memory System, which memorizes settings for the power driver's seat, outside mirrors, and steering column. In addition, drivers can add an optional wood-grain-trimmed steering wheel and door pulls. The Azera's large, wide trunk offers 16.6 cubic feet of cargo space. The trunk lid opens high, which eases loading and unloading and enables drivers to stow large items. The 2009 Hyundai Azera comes equipped with a full range of safety features, including electronic stability control, traction control, adjustable head restraints, and a full range of airbags, including front, front-seat-mounted side impact, rear-seat-mounted side impact, and roof-mounted side curtain airbags. The antilock braking system includes brake assist, which applies maximum braking force in an emergency situation. In addition, the Azera comes equipped with an electronic brakeforce distribution system, which automatically adjusts the amount of brake force applied to each wheel's brake to ensure optimal performance in all driving situations. The Azera earned a top crash test rating of "good" for frontal offset impacts from the Insurance Institute for Highway Safety, and an "acceptable" rating for side-impact tests. The 2009 Hyundai Azera receives a strong recommendation from many owners, drivers, and reviewers. Owners find the 2009 Azera attractive, comfortable, and an outstanding value when compared to similarly equipped luxury sedans from other automakers. One owner considers his Azera more comfortable than a Lincoln or Mercedes for long-distance driving, while others prefer the Azera to the Toyota Avalon, which comes with a higher pricetag. Even the GLS with the 3.3-liter V6 engine provides good performance and very good handling, owners note. They also like the sedan's quietness, solid feel, smooth ride, and extensive list of features. However, a number of owners note problems with the Azera's detail work and fit and finish, such as problems with trim and exterior paint, and some have had their new Azeras in the shop for repairs. CarGurus owners similarly give the Azera overall good marks for its impressive performance, agile handling, and confident braking. In addition, the Azera offers plenty of interior room for four or five adults and delivers acceptable fuel economy, CarGurus owners note. Overall, while owners note the Azera might not be quite as refined as some of its competitors, it represents a great value in an entry-level luxury car. What's your take on the 2009 Hyundai Azera? 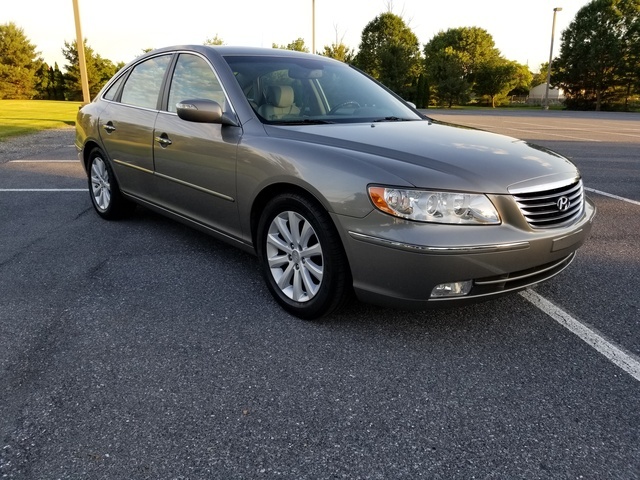 Have you driven a 2009 Hyundai Azera?